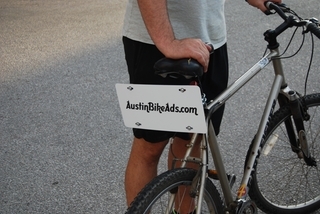 Locally owned and operated, Austin Bike Ads (ABA) provides a unique and valuable service to businesses through the placement of high-visibility brand awareness ads on commuter bicycles. Advertisers purchase advertising space from ABA, and ABA selects cyclists to ride in SXSW areas with heavy foot traffic. ABA charges per cyclist, per hour, with routes and times determined in conjunction with the advertiser. ABA handles all aspects of the advertising process, including ad printing, installation, removal, and cyclist management. ABA uses a customized tracking system to monitor its cyclists. By hyper-targeting an ad to a specific route, advertisers build brand awareness with repetitive viewings. In 2010, SXSW drew over 35,000 attendees during its three weeks, with that number increasing to over 36,000 in 2011. There is not a more unique, green, effective means of spreading your message during SXSW than ABA's bicycle advertising program!